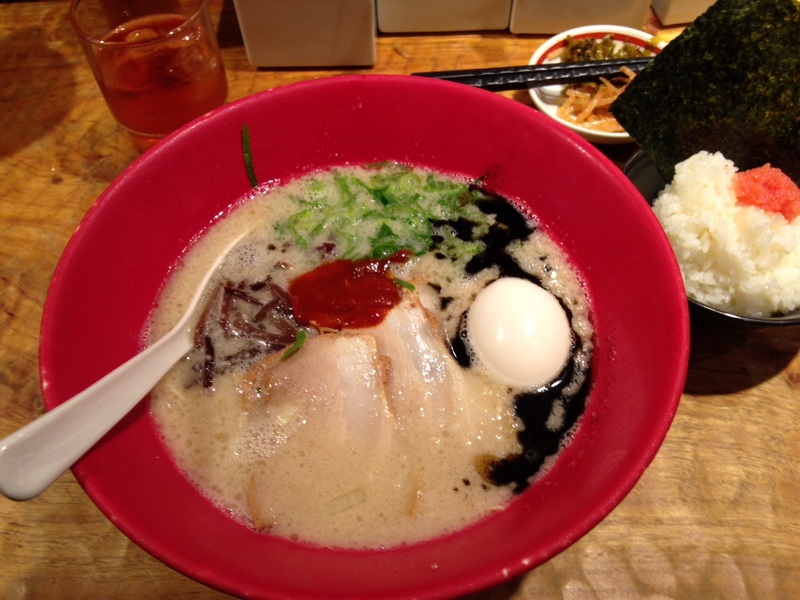 If the way to a person’s heart is through one’s stomach, then Japan has won all of us over. Food here is plentiful, beautiful, delicious, and everywhere. 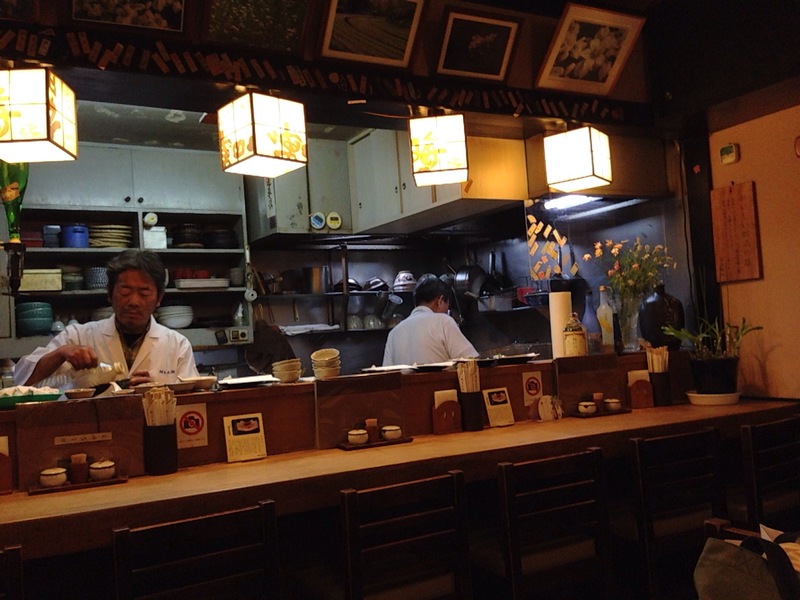 Like most cultures, Japanese people define themselves partly through their food. What one eats, and when one eats, is an identity statement. 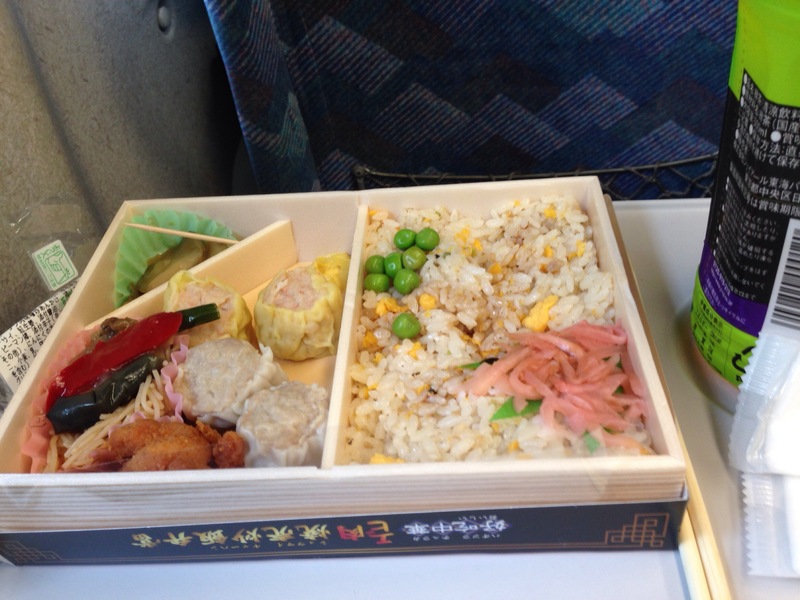 Take breakfast: rice, miso soup, a salad, a small amount of egg, and a little fruit was typical on our trip. If the 14 hour plane ride hadn’t convinced me I was far from home, this breakfast certainly made the point clear. I was a far cry from oatmeal and fruit or bacon and eggs, but it was delicious, or oishii, nonetheless. 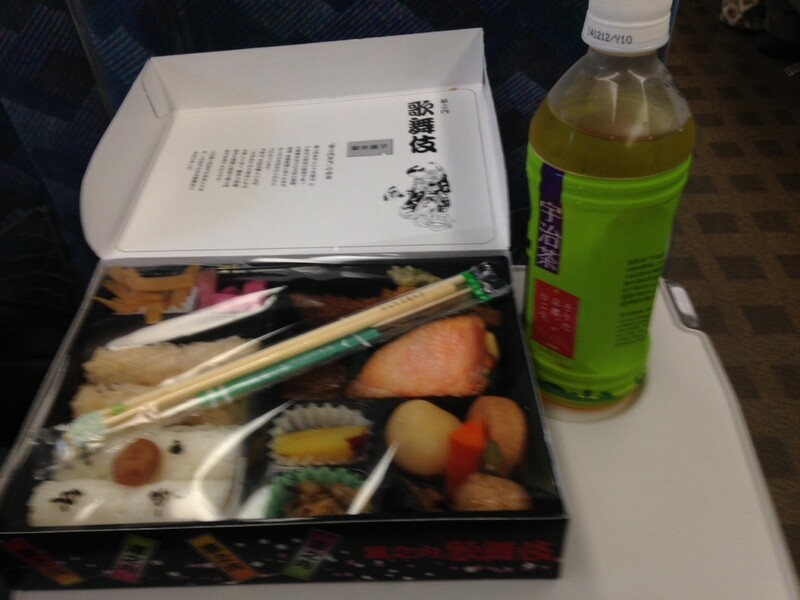 We have many different lunches, but the bento box left an impression. Its multiple forms and ubiquitous presence made it a staple of our travel days. Bento points out an important principle of Japanese eating, small amounts of a large variety of foods, presented in an aesthetically pleasing form. Its style of food that seems to me to express much about Japan, but especially the notion that sustenance and pleasure can be had at the same time in the most mundane of things. Miso soup and rice, fish and rice, pickled vegetable and rice, even ramen and rice, (although my Japanese friend Mariko, whom I met in Tokyo for dinner, thought that seemed a bit strange). Are you sensing a theme? Rice is central to Japanese food. It accompanies most meals, it is used in different forms in all kinds of different foods, you make sake with it, the inari (foxes) hold the keys to the graineries that store it. At the same time, Japanese food culture makes it clear that Japan has a global culture. Of course American fast food is easy to find, but the popularity of French-style bakeries was a pleasant addition to our trip on many occasions. Italian-style restaurants were also common. 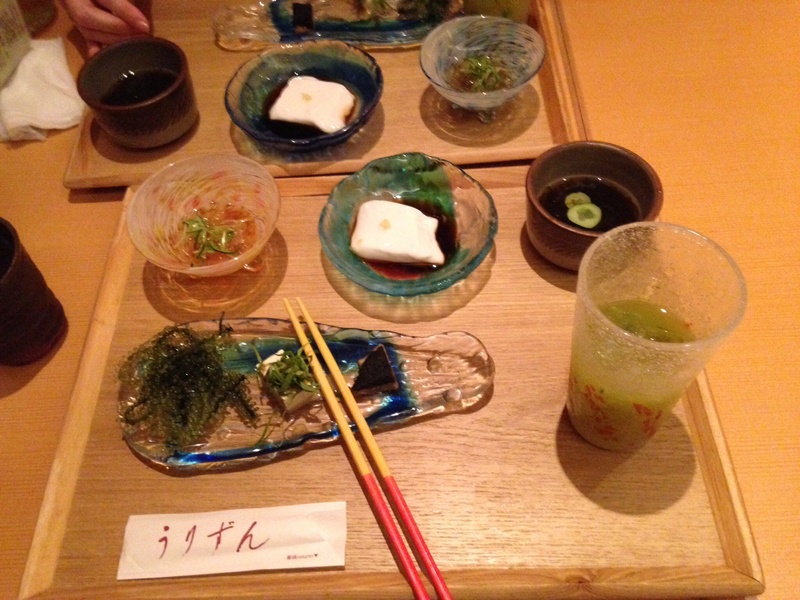 The Okinawan meal I shared with my friend Mariko on our last night in Tokyo was one of my favorites. It was a “healthy” meal with lots of varieties of sea weed, small portions of pork and tofu, and a soup with vegetables and brown rice. Food is clearly a central part of hospitality in Japan as well, with many gift shops and souvenir stands devoted to local food specialties. It is common for Japanese people traveling to see friends to pick up a local food gift to give to the person they are visiting. I could go on, and on, and on, but a partial list of the the fascinating food topics must include the amazing variety of pickles, teas, and soft drinks, the central role of fish in the Japanese diet (octopus on stick, anyone? ), and the role food plays in ritual. On Saturday, we started our day with a nutritious daily breakfast, featuring seaweed salad and yogurt with sugar powder at the Kyoto Hana Hotel. Then with a hop, skip, and a jump (two hours on the Shinkansen to be precise), we arrived in Hiroshima to visit the Hiroshima Peace Memorial Museum. This museum memorializes the destruction of Hiroshima and its people by the atomic bomb dropped on 6 August 1945, and their quest for the elimination of nuclear weapons worldwide. 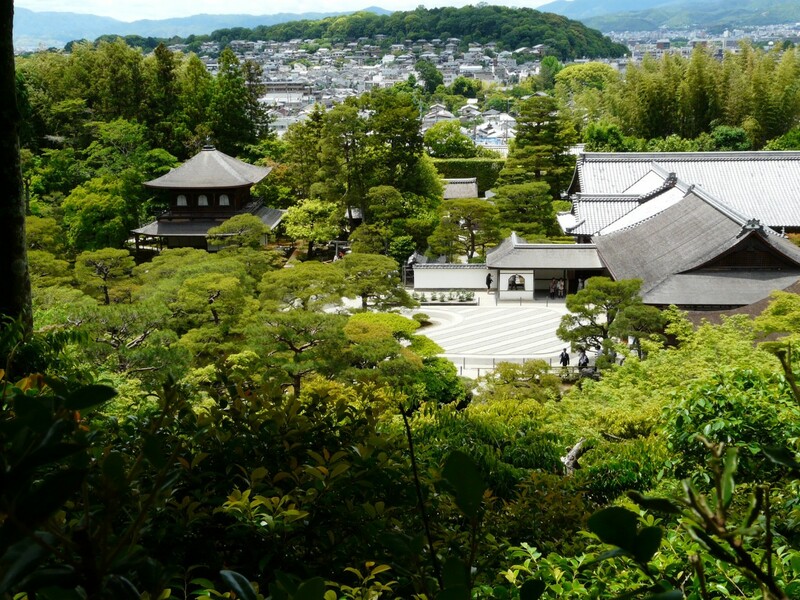 We started from the eastern wing of the museum, which featured Hiroshima before and after the atomic bomb was dropped at 8.15 a.m. Visitors learn about the development and deployment of the bomb, its destructive capacity and the devastating consequences. 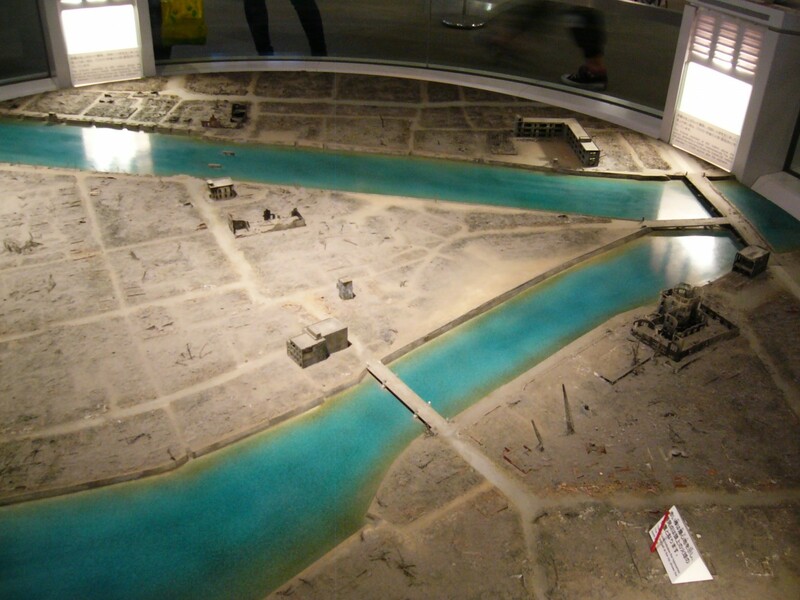 The scale of the destruction was encapsulated by the before/after-model of Hiroshima. 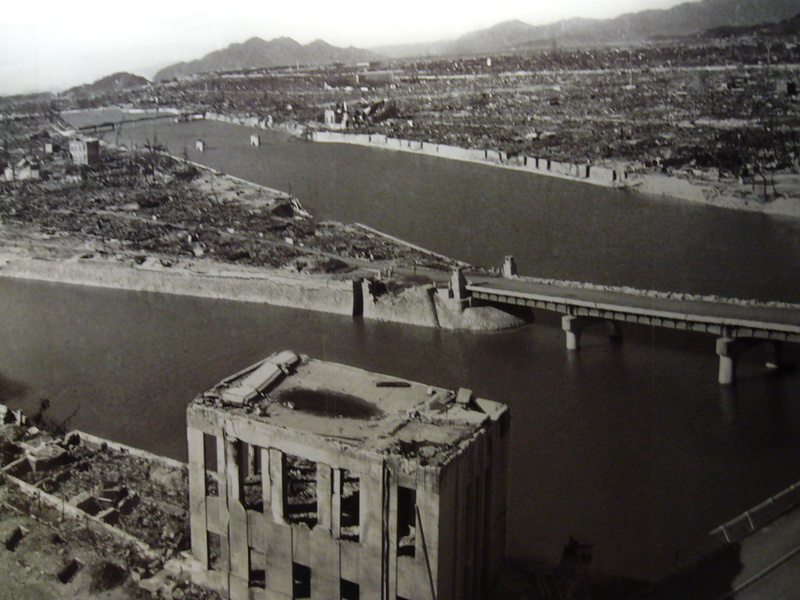 Hiroshima just before the atomic bomb was dropped (above) and after (below). I found the center wing most gripping and disturbing. Visitors learn about the damage caused by the radiation, heat rays and the blast itself, and walk through displays of personal effects left behind by victims and survivors of the ordeal. The charred uniforms of little boys and girls were especially difficult to view. The stories of survivors who went on to suffer from multiple types of nuclear related health issues were equally upsetting. Survivors right after the ordeal. 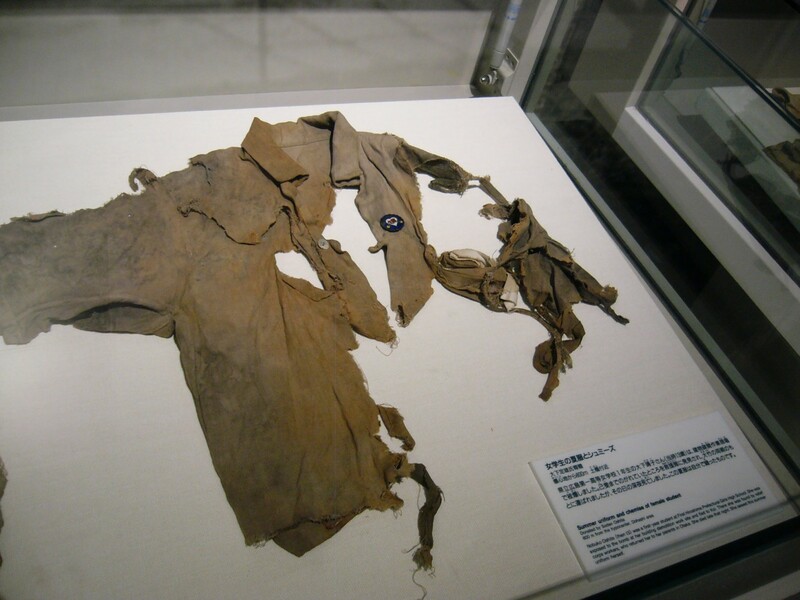 Uniform of a a school girl. 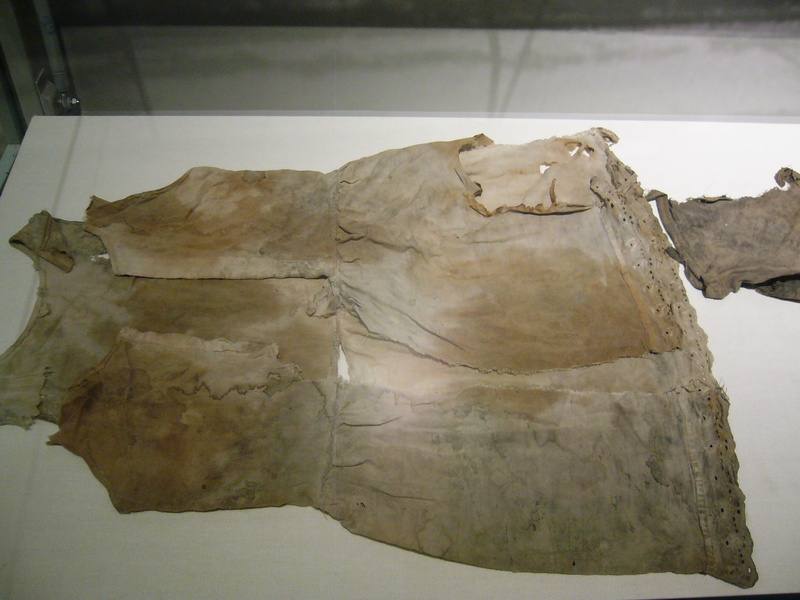 Charred uniform of a schoolboy. I visited the museum in 1997. I might have missed it the last time but this time I noticed that the exhibition included some description of Japanese wartime activities and the fact that many Korean and Chinese prisoners-of-war died in Hiroshima during the atomic attack. History is always being rewritten and reinterpreted and the museum is a testimony to that. 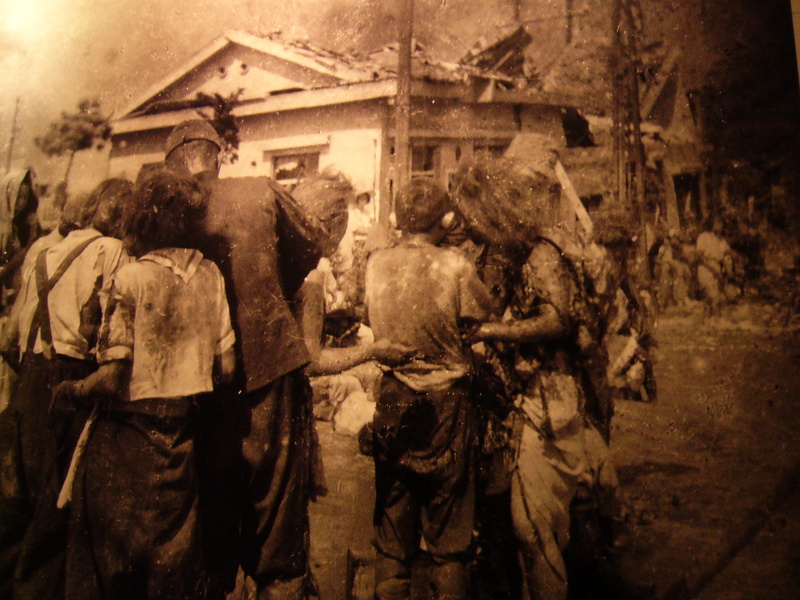 The American bombing of Hiroshima and Nagasaki continues to be a heated topic of discussion among historians. The museum was never meant to be merely informative, but is supposed to discomfort us so that we do not cease to question the development and use of devastating weapons on fellow humans. 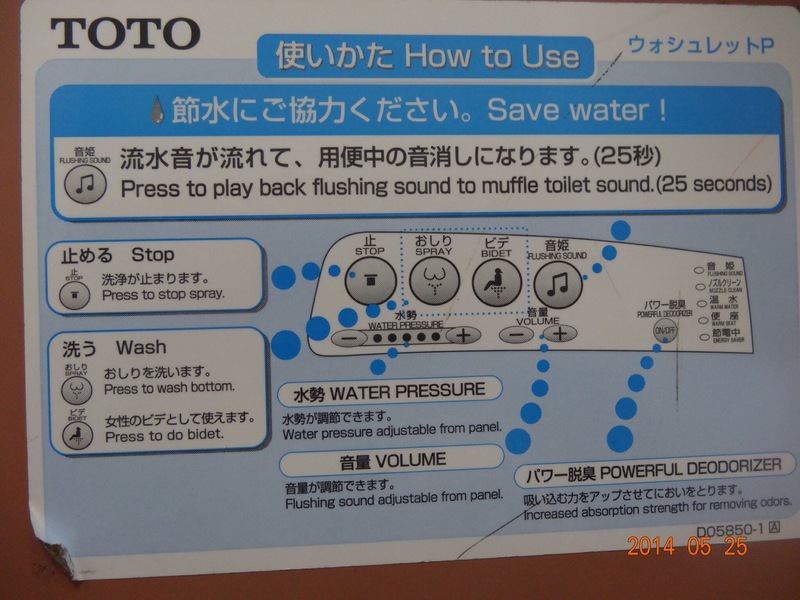 I think that each of us has been fascinated with, and a little in love with Japanese toilets. 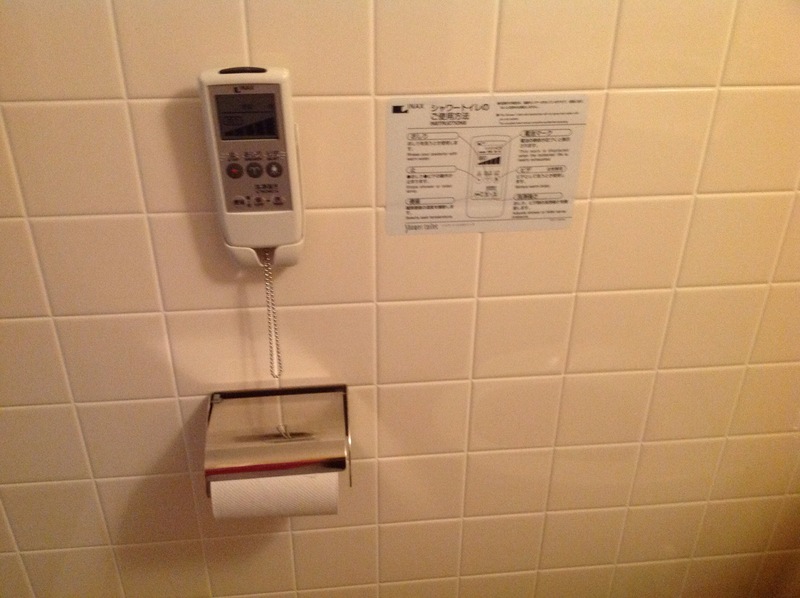 At our first stop at the ICU Guest house, we were introduced to the joy of heated seats, bidets, showers, and a flushing noise to disguise unpleasant sounds. All located on a remote. 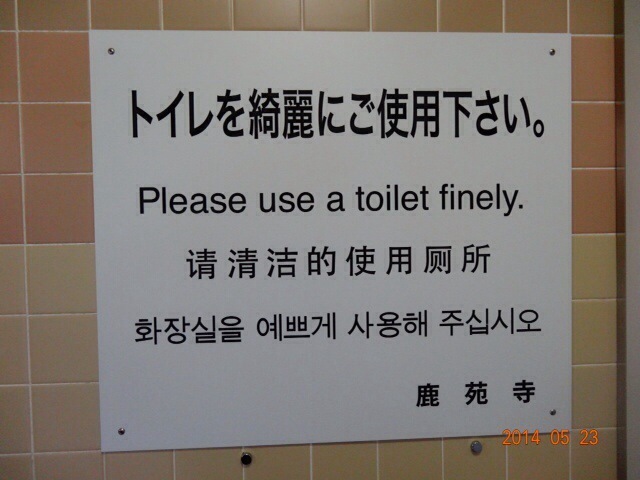 The Japanese have amazing public restrooms. 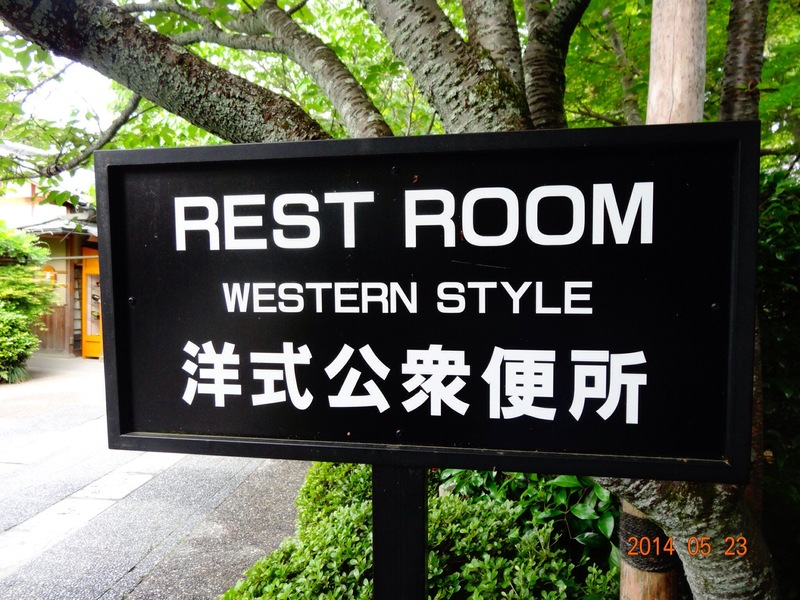 A few of them are the old style “squat” toilets, but it is not hard tofind western style, clearly labeled. 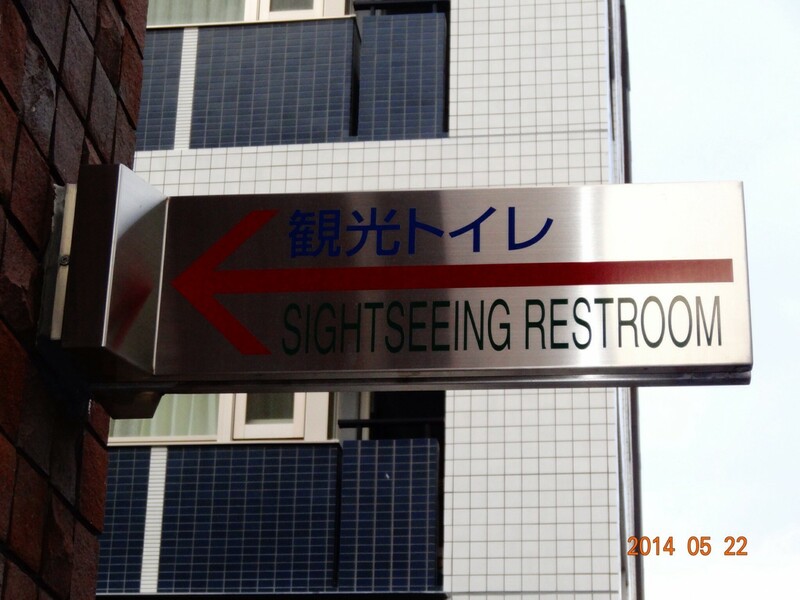 We were amazed to find “sightseeing” restroom while walking through the city of Kyoto. In was exceptionally clean. 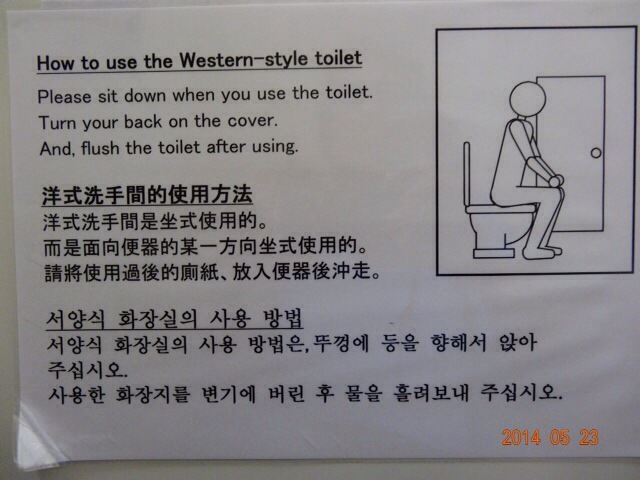 Finally, the instructions and signage for foreigners on the proper use of toilets was quite amusing, and often helpful! What is tradition? What is the value of tradition? How do we move forward and still respect the past? This theme was present in many aspects of Japanese culture, including fashion. 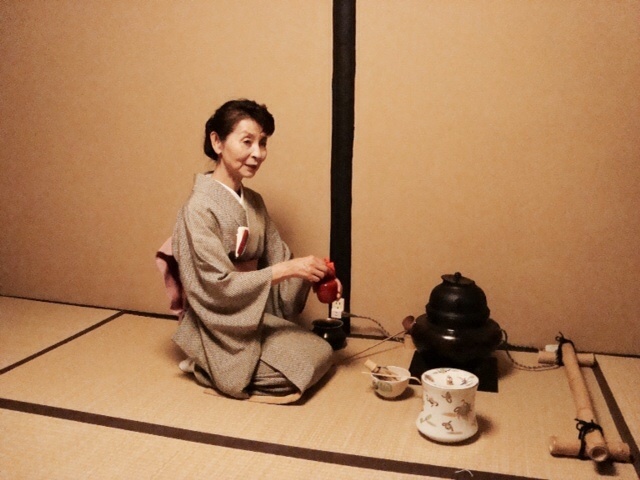 The importance of ceremony and tradition was salient during our introduction to the tea ceremony in Kyoto. Our hostess, Meiko, wore a beautiful kimono. The gown, she explained was an all-season pattern, but her obi, or sash, was chosen to reflect the spring season. In this case, fashion is an important part of tradition. 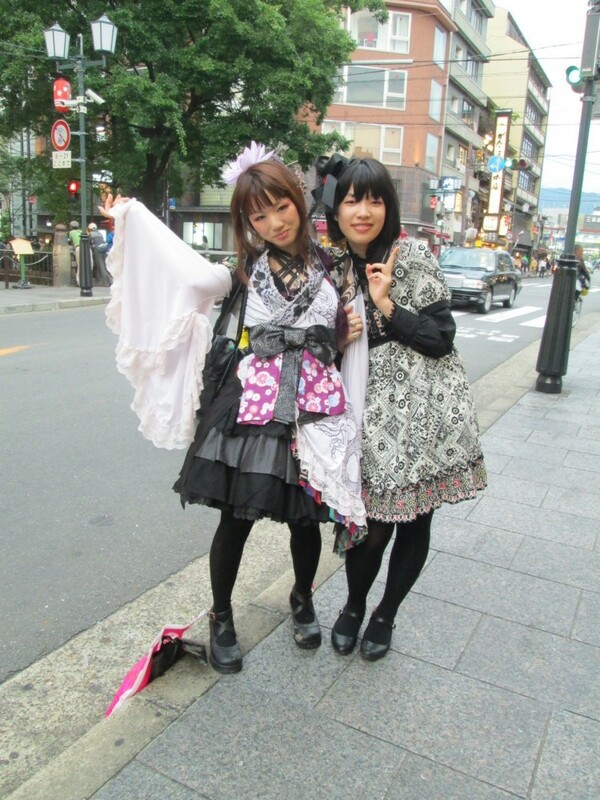 Although many of the women we saw dressed in kimono were older women, we also saw many young women in kimino. 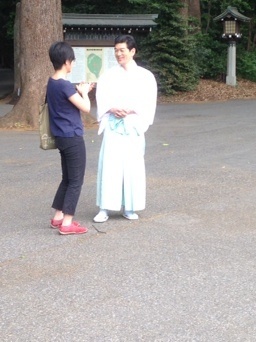 According to our taxi driver, female tourists sometimes rent kimono for the day to wear while shopping and sightseeing. Just as in America, fashion styles differ widely among young people. The categories of boho, hipster, preppy, and grunge may not exist, but certainly young people (and older people) ascribe to different fashion aesthetics. 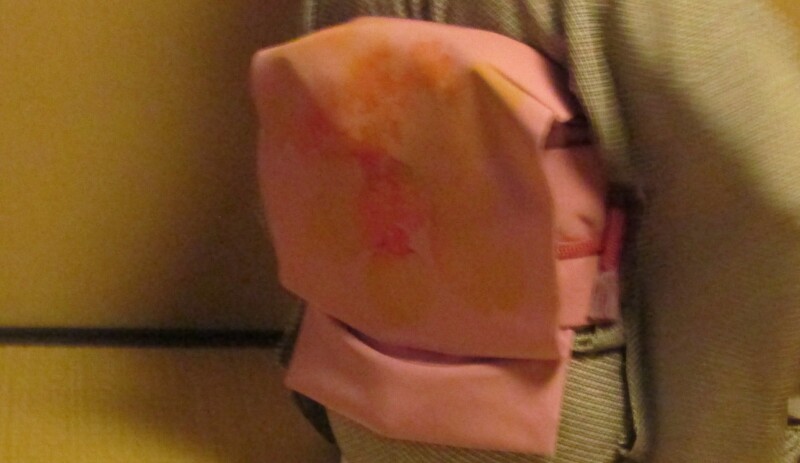 In the first photo, you see lace, ruffles, bows, and hearts. The women have pink-hued blush and lipgloss, giving them a very sweet and feminine look. You might notice on the women wearing skirts that they are wearing nearly sheer stockings, contributing to the pure and innocent look. The items of clothing themselves are not especially unique; Forever 21, Zara, Gap, H&M are all stores found from Shibuya crossing in Tokyo to Beachwood Mall in Ohio. But, the entire look reflects certain cultural values; in this case purity and innocence in women. In the second picture, you see a slightly different look, one with more edginess. The woman is wearing a navy peplum-cut dress, however her accessories and makeup change the look from innocent to confident. She wears brightly-colored platform sneakers, a beanie cap, and bright lipstick. She has several ear piercings and a streak of bright color in her hair. In the final look, observe how the women’s outfits pay homage to the kimono. The woman on the left is wearing a dress with a kimono-like wrap cut, a dragon print, large bell sleeves, and an obi-like purple sash. Nothing about these women says “traditional”, yet their outfits weave elements of tradition dress into a very contemporary look. What struck me about the clothing was how well put together most people are. Regardless of which particular look a person is trying to achieve, there is an attention to detail, to presentation that we often don’t see in the states. I don’t think I saw one woman in sweatpants or flip flops. Men carry some of the most amazing bags. 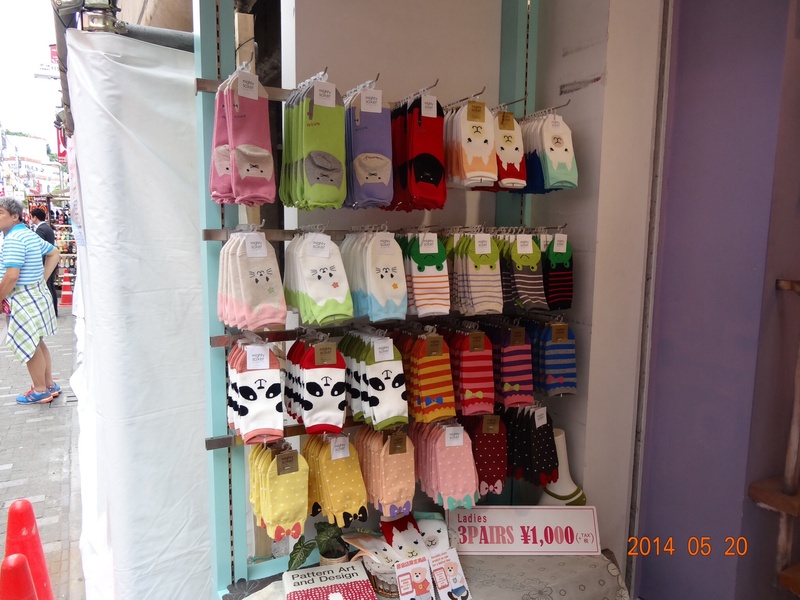 We passed by numerous sock stores on our outings and the variety of designs and patterns is almost overwhelming. Perhaps it is this emphasis on presentation and attention to detail that best reflects the role of tradition in fashion in Japan. Styles change, and the globalization of clothing brands means those of us in industrialized locations have access to the same items. But, the way in which we select and assemble those pieces reflects something about our cultural upbringing, values, and expectations. **Special thanks to the women who graciously agreed to pose for the pictures. 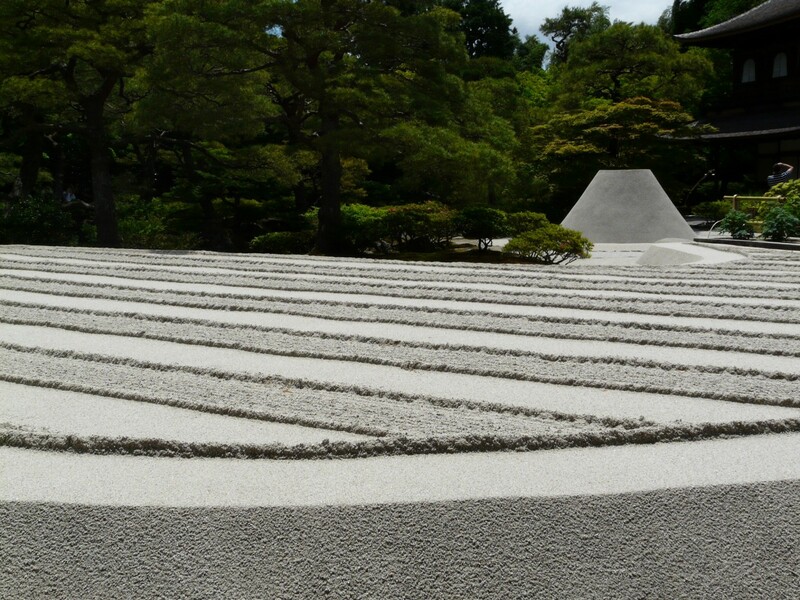 Next we ventured to nearby Kinkaku-ji, another Zen Buddhist temple. 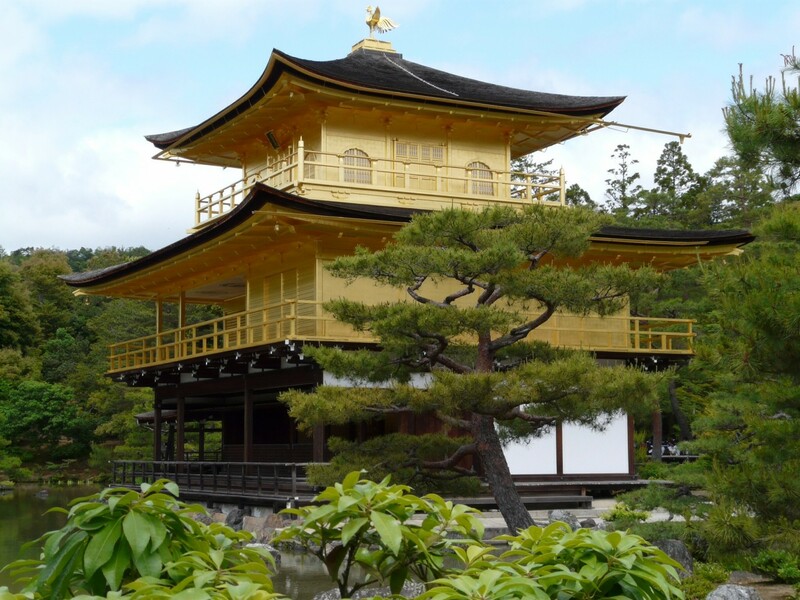 The centerpiece of the temple precinct, the “Golden Pavilion”, was originally built in the fifteenth century as a retirement villa for Shogun Ashikaga Yoshimitsu. 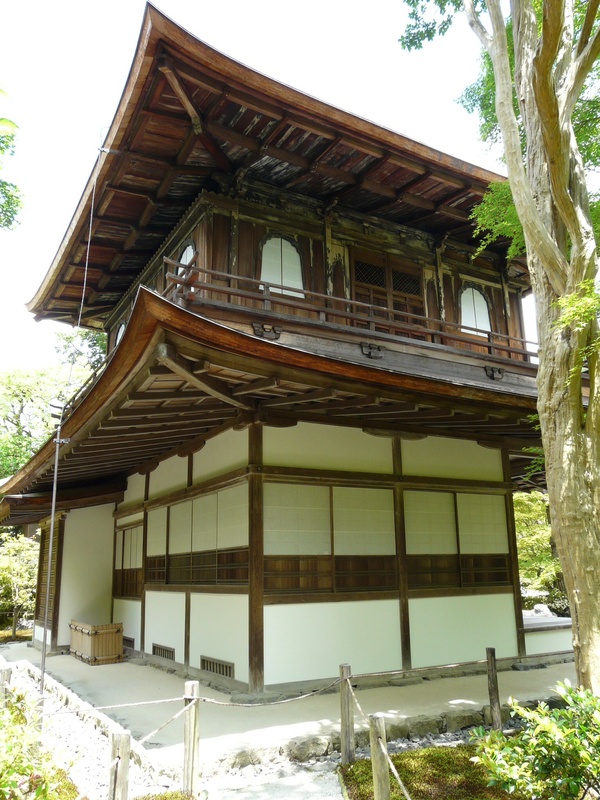 After Yoshimitsu’s death, his son fulfilled his father’s wish to have the building converted into a Zen Buddhist temple. 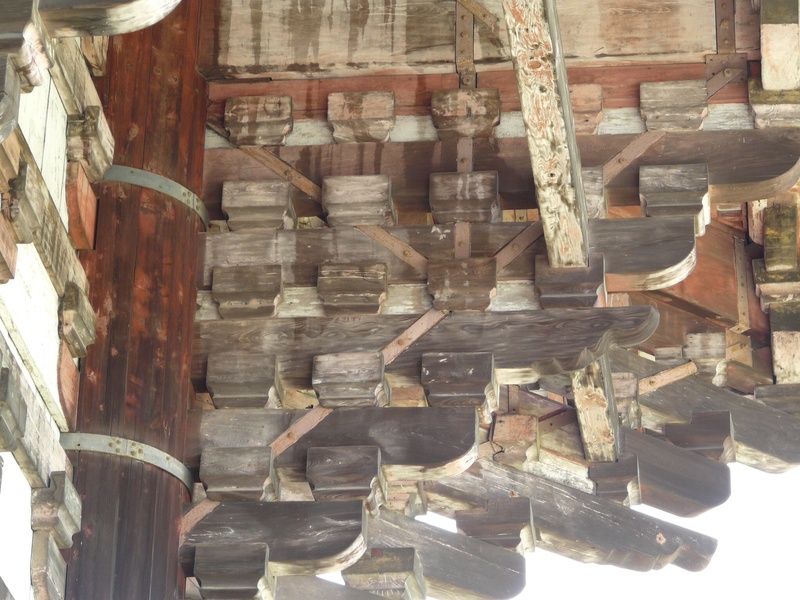 Regretfully, what we see today is a modern reconstruction of the original structure, which was burned to the ground in 1950 by a disturbed novice monk. As was the situation at Ryoan-ji, we were accompanied at Kinkaku-ji by droves of uniformed schoolchildren. Not a bad place to retire! It’s good to be Shogun. 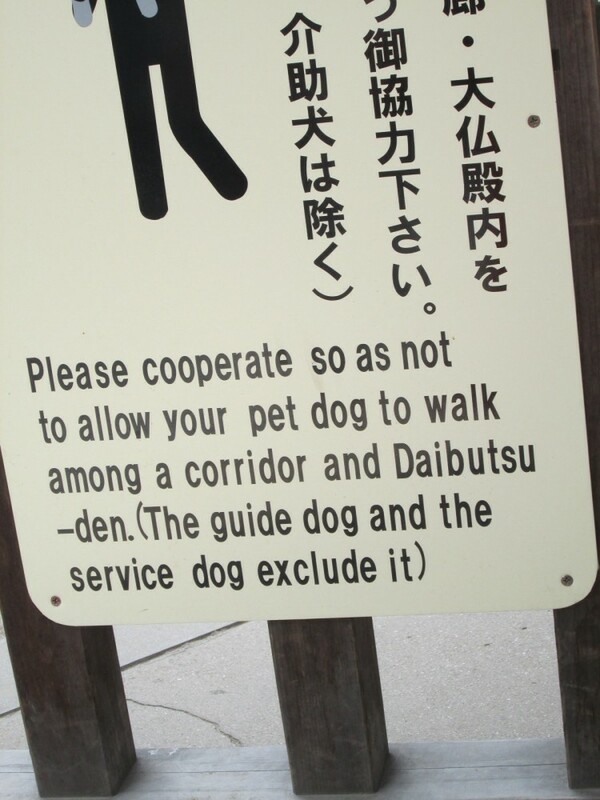 Japan is a set of islands of small area for the size of its population, and we were prepared for the relative crowding and lack of private space that seems typical especially of Tokyo. 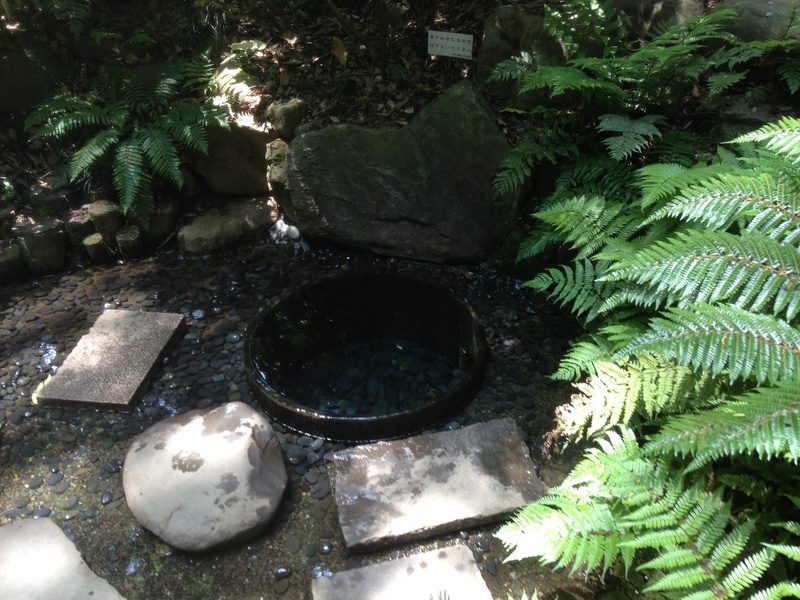 What I was not prepared for is how the Japanese establish physical borders of various sorts that serve to create spaciousness within confinement, in a way that makes for both an aesthetics and an ethos. 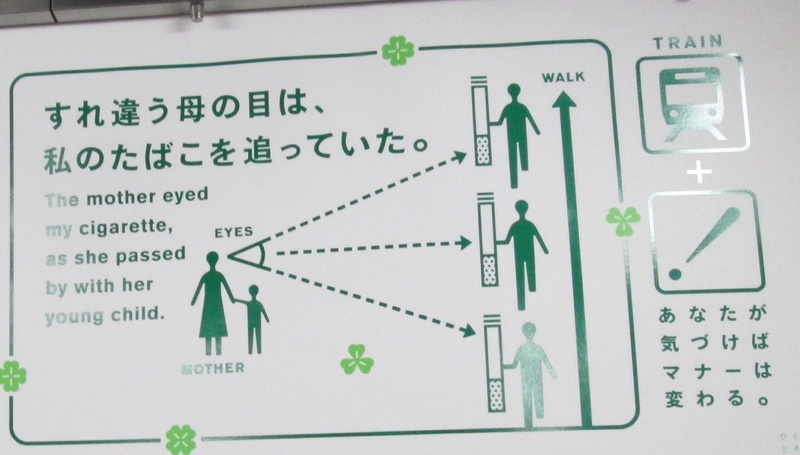 I first thought about this when, crossing a bridge in Kyoto over the river that lies between our hotel and a bustling area of shops and restaurants, David mentioned that young Japanese couples come to the bridge to escape parental eyes and to create a private-public space. The bridge offers a nice metaphor for the particular ways in which space is demarcated here. 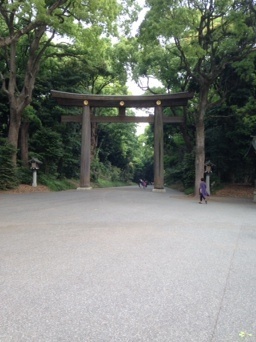 One of the first examples we encountered was the spectacular torii, or gate, marking the entry to the Meiji Shrine, a photo of which Jeremy included in his post. The gate signifies an especially powerful boundary between the teeming, modern streets of Tokyo and the serenity of the many wooded acres of the shrine grounds, which our guide described as sacred and which felt to be hundreds of miles from the sounds, sights, and smells of the urban environment in which the grounds are situated. 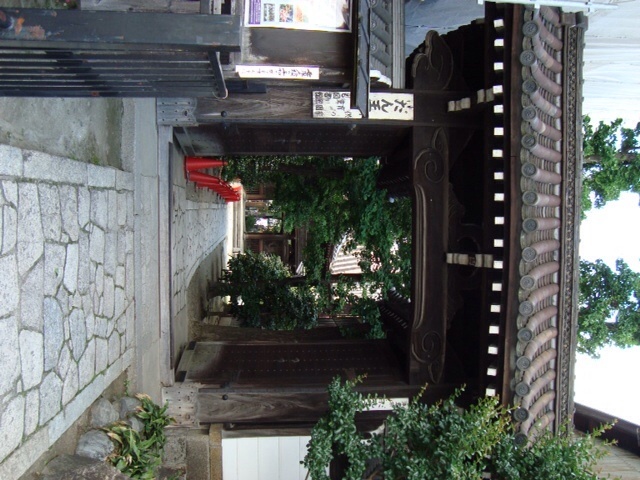 Each Shinto shrine or Buddhist temple we have visited has included such torii, from the small temple down the street from our hotel, pictured here, to the vast gate on the promenade to the shrine at Nara about which Diana has written. 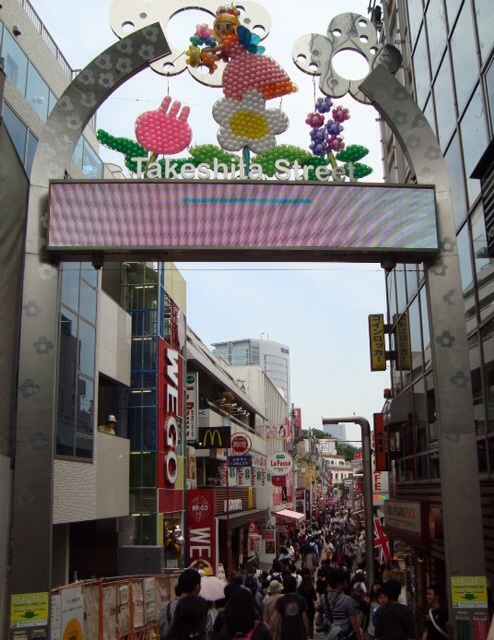 And there’s even an echo of the torii at the head of a thronged shopping street in Tokyo! 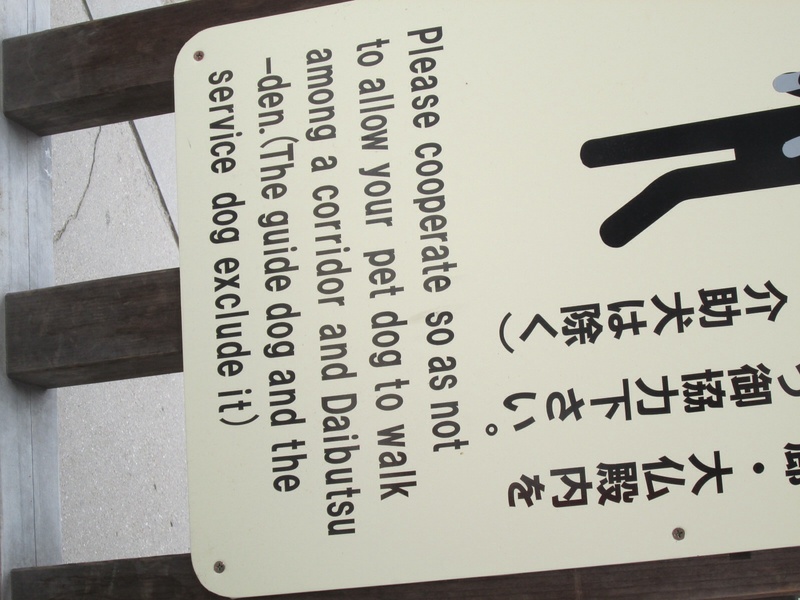 The framing of space occurs in many other areas of Japanese life as well. 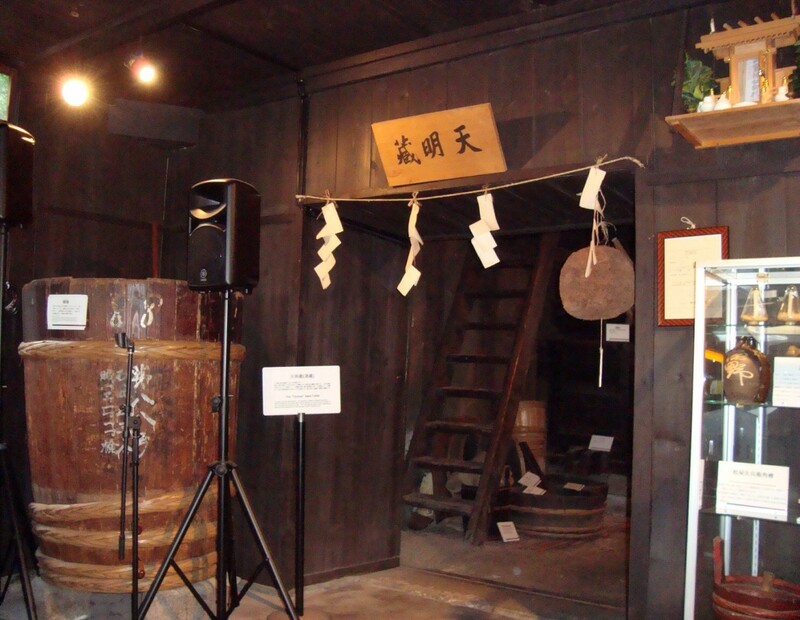 At a sake museum and former brewery, we saw ceremonial folded papers, or shide, signifying purity, hanging above the threshold between two rooms to mark the “sacred space” of the brewery room. Some of us were instructed in the Way of Tea, or the “tea world,” as our hostess called it. 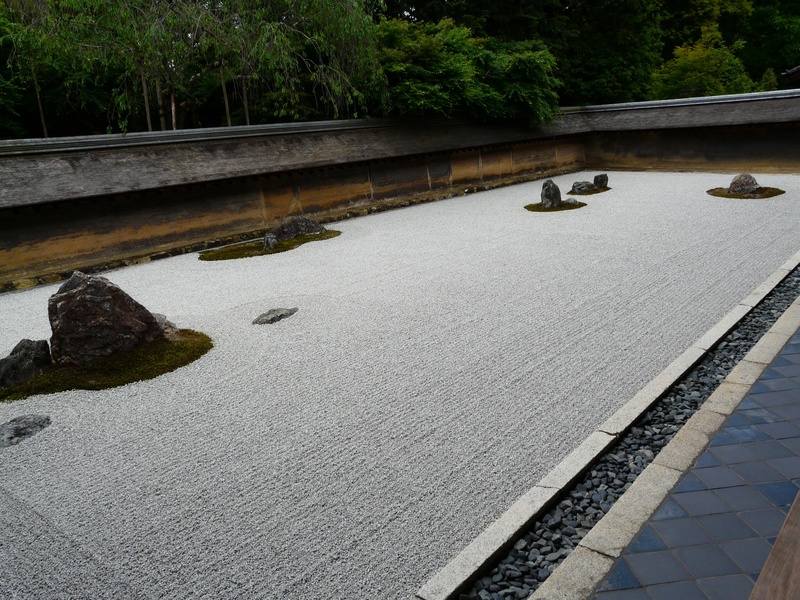 The Japanese tea ceremony, which originated with Zen monks who brought tea from China, is a highly choreographed formal social occasion, whose four principles, of purity, respect, harmony, and tranquillity, are enacted in every gesture. In the small room in which the tea ceremony was demonstrated to us, we were asked to conform our bodies around the dark borders where one tatami mat abuts another. The ceremony is conducted within a space our hostess named as sacred, and it is bounded on one side by a large piece of bamboo, framing the precisely placed objects of the tea service. The room itself, as well as the social ritual, seems to serve as a place away from the world. Of particular interest was the principle of kei, or respect, which included a ritual according to which a warrior entering the ceremony would lay aside his sword and place a fan horizontally in front of him on the tatami mat to signify his peaceful participation. I expected formal elegance and orderliness in something called a tea ceremony, but I have been especially surprised to notice how the framing of the things of the world appears even in such an ephemeral matter as the lunches we purchased from a vendor at the train station. 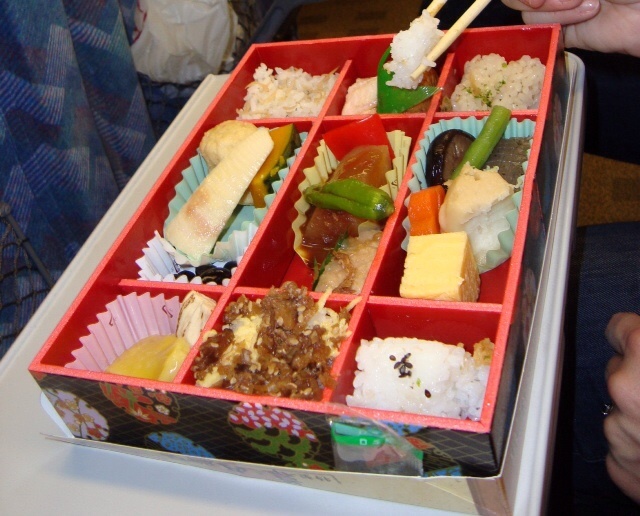 These “bento boxes” are very common lunches for adults and schoolchildren alike, and, as our guide, Lisa, mentioned, the presentation of food is as important to the Japanese as the subtle flavors. But who would have thought that such presentation would take the form of a grid that neatly keeps the flavors apart? 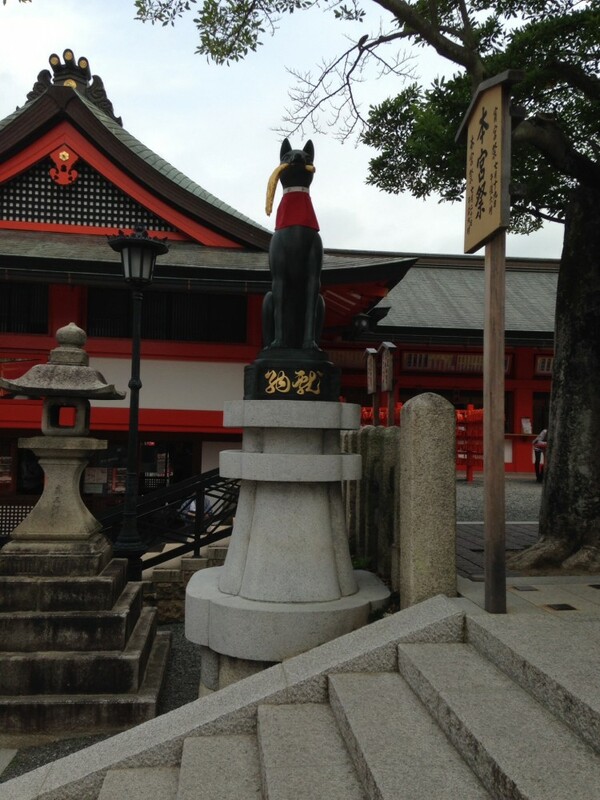 Today we traveled from Kyoto to nearby Nara. 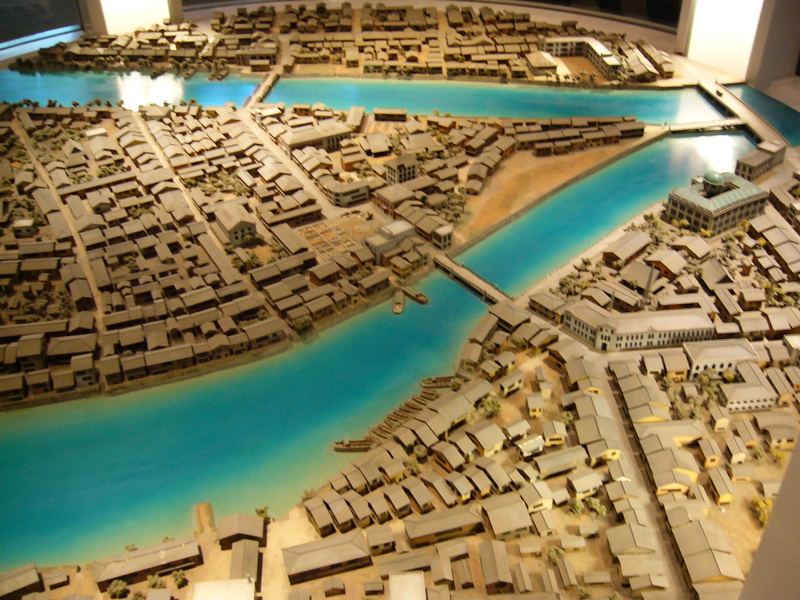 From 710 to 784, this city of 360,000 served as the first permanent capital of Japan. 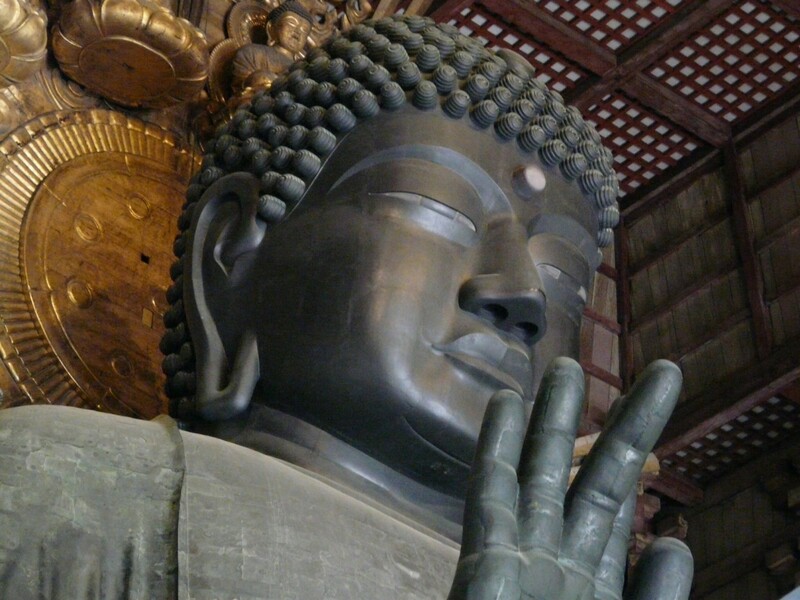 We spent most of our time at the Buddhist temple complex of Todai-ji. Before entering the temple grounds, we were introduced to the “locals”: some of the 1200 tame deer that live in the Nara-Keon park. 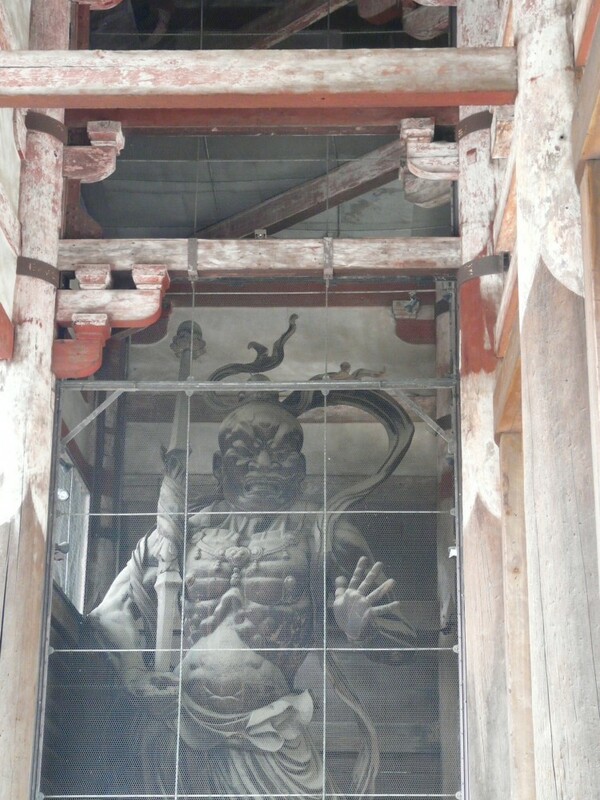 After passing the scrutiny of the Nio guardians, we proceeded into the temple precinct. 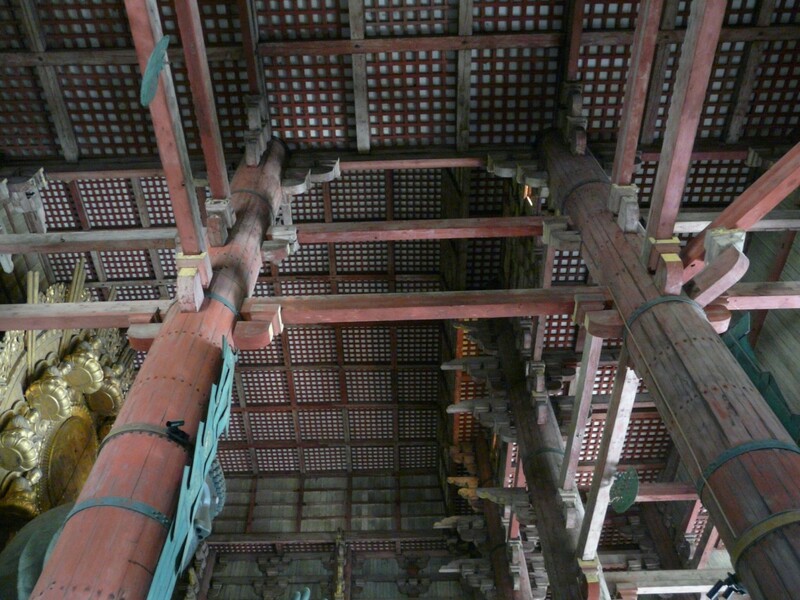 Chinese and Japanese Buddhist temple complexes from this period typically feature one or more pagoda towers with relics associated with the Buddha’s presence and a main hall (a Buddha hall) containing images of Buddhas and Bodhisattvas to venerate. 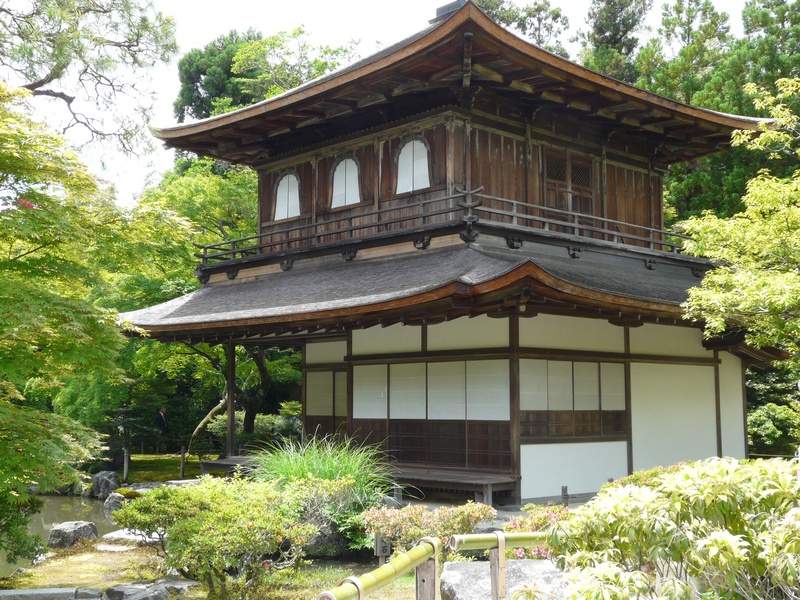 Unlike the nearby Kofuku-ji temple complex (which we also visited today), Todai-ji no longer features a pagoda; the main hall (called Daibutsu-den), however, remains extant. 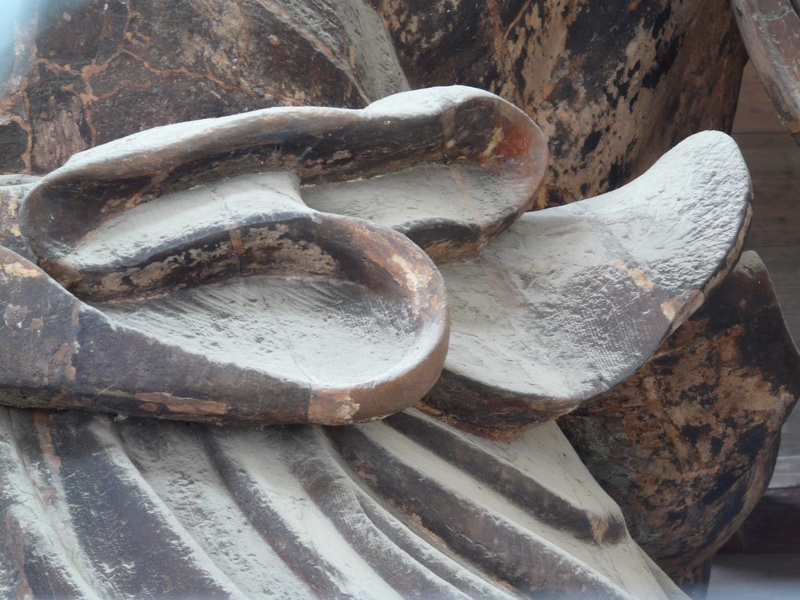 Along with being dazzled by Daibutsu, we enjoyed some light-hearted moments at Todai-ji. 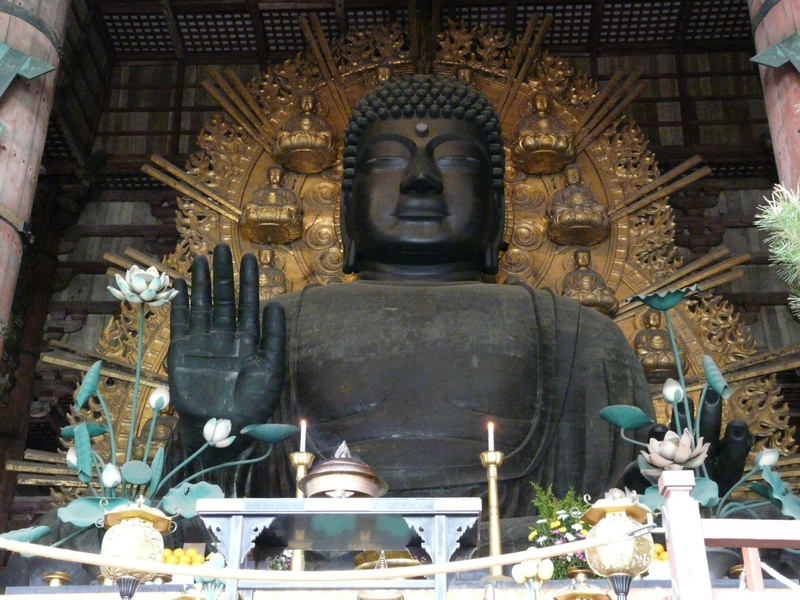 A flood of Japanese schoolchildren on a trip approached us to conduct VERY brief English-language interviews and we watched their peers attempt to demonstrate their enlightenment by squeezing through a hole in a column in the Daibutsu-den the same size as the great Buddha’s nostril! 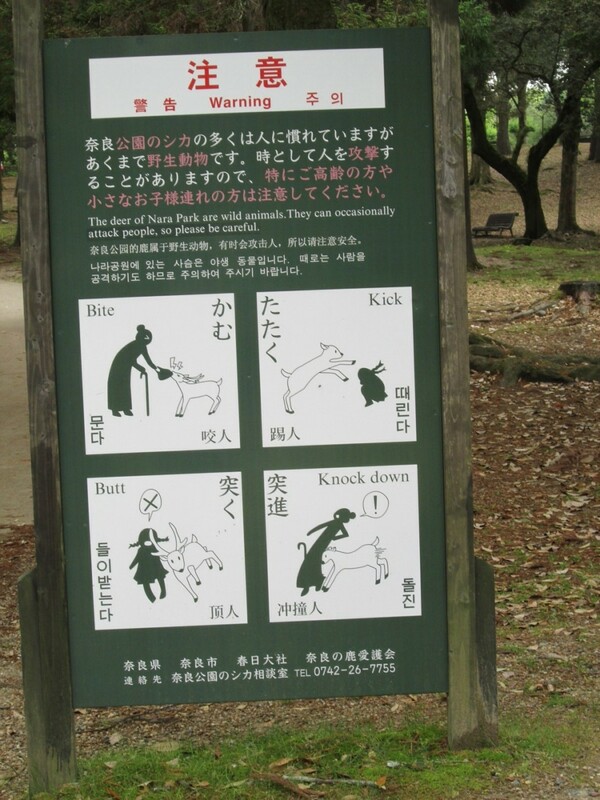 One thing we have found humorous and fascinating has been the signs all over Teaching us about our manners. 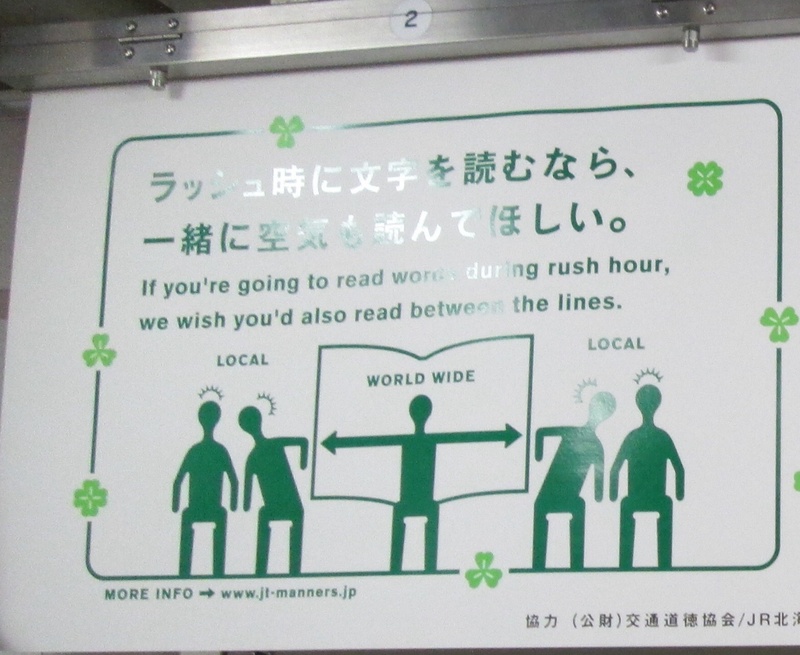 nearly all of the trains have signs with instructive lessons. This one shows us how to read the newspaper on the train. 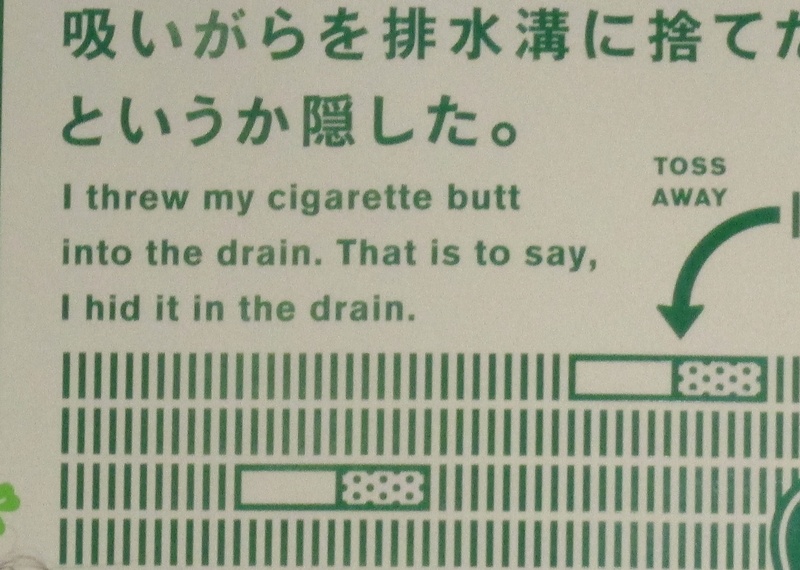 These next ones talk about smoking…the first one really confused us at first. 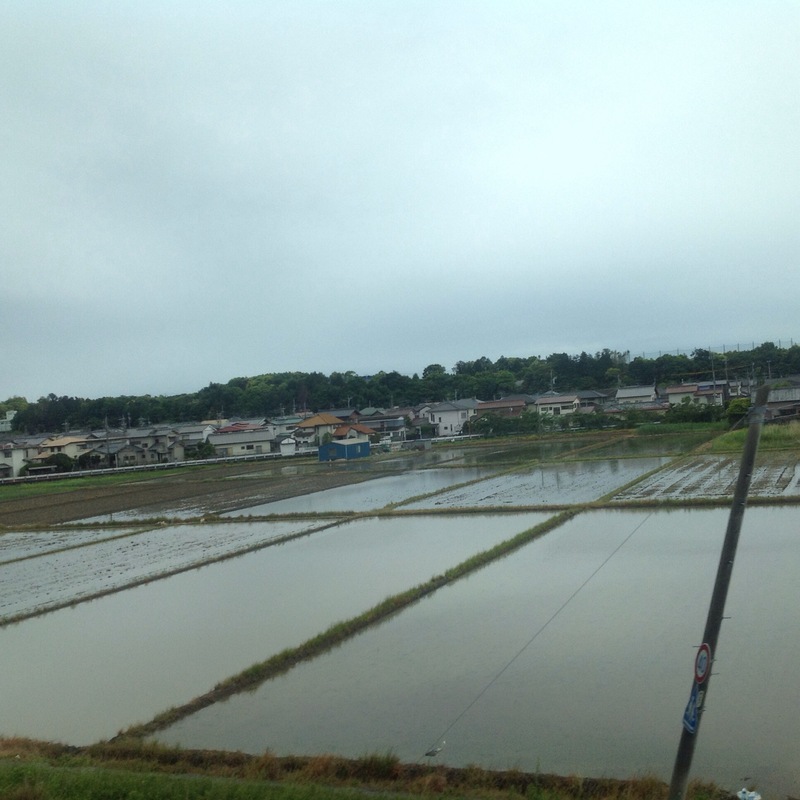 Our day began early today with a lovely breakfast with the President of International Christian University, Junko Hibiya, followed by a bullet train ride past many rice fields (and the traditional bento box), ending in Kyoto. Our discussion at one point then turned to gender roles in Japan, dovetailing nicely with a number of conversations we had been having. President Hibiya reported that while Japan has made progress in gender issues, it is woefully lagging other countries, ranking now 120 in the status of women (mostly due to the lack of women at the head of government or heading the major corporations). She is currently the only women to serve as the president of a college or university that is not a woman’s college. Nonetheless, as do we, they struggle a bit to get some of their male students engaged–nearly all of their participants in study abroad and experiential learning opportunities are women. Amber will likely blog more about fashion in Japan, but it is clear that women in Japan worry a great deal about beauty. Many of the signs on the subways and trains are about cosmetics, and indeed few women we see are without makeup. Our guide, Lisa, explained that women are very concerned about “future beauty” and about the aging process. We were surprised, and a little amused, to learn that sometime the many white masks we see people here wearing are not simply about disease transmission! Lisa told us that sometimes women, including her, will wear the mask and sunglasses when they have not had time to put on their makeup. Better to be seen as sick rather than lacking beauty! Lisa tells us, however, that cosmetic use among men is also high! As day yesterday began with a presentation by a Shinto priest and ended with Sumo, we talked some about various expressions of masculinity in Japan. On the street we saw rickshaw drivers in very short shorts, and shirts displaying a sort of hypermasculinity (though we did see a woman rickshaw driver). We saw Sumo wrestlers after their match heading to the restaurant or bar, and “salary men” heading home at 9 o’clock in their nearly all black or dark grey suits. Supposedly, however, there is a class of young men who are opting out of the rigid expectations of the “salary man” life, particularly a the long commutes take them too far away from home and community. An article in Slate calls these “grass-eating men,” or soshokukei danshi (草食系男子): http://www.slate.com/articles/news_and_politics/foreigners/2009/06/the_herbivores_dilemma.html. These are men, some say as many as 60% between 20 and 34, who have shunned interest in dating, marriage, or traditional masculine ways. 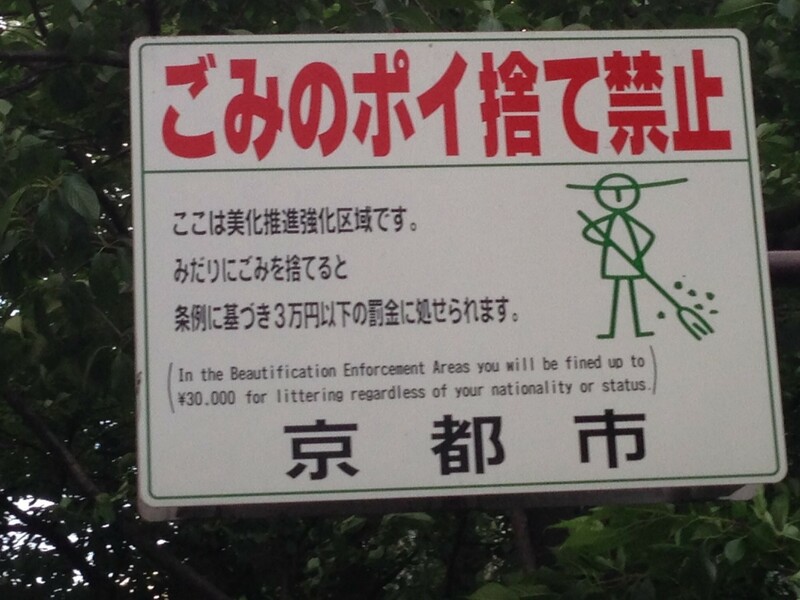 This has raised in Japan a bit of concern that Japanese men are becoming too feminine. But among shopkeepers, and certainly are waiter last night, traditional models of masculinity seem present as well! 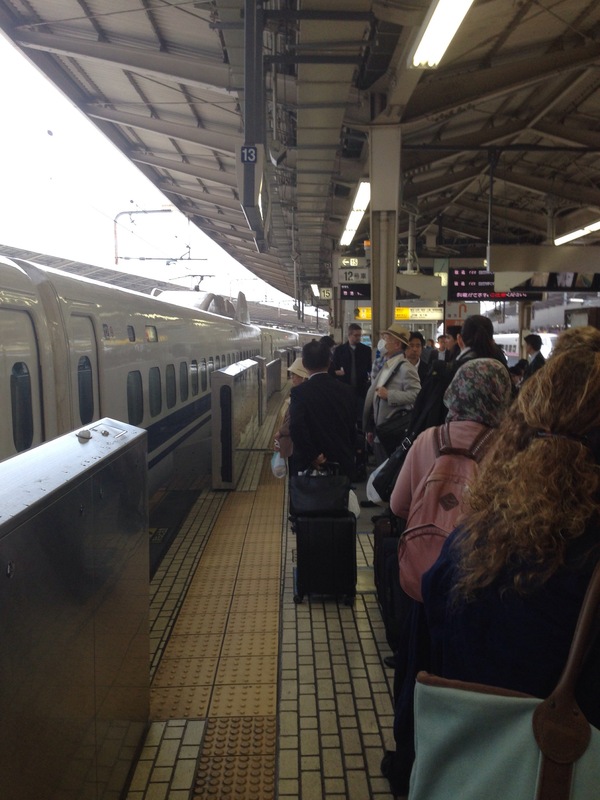 Our day started with a bit of a mad dash to catch the bus so we would make it on time for our Meiji Shrine visit. The best part of running with a group of academics is that someone will think of good metaphor for the affair, and sure enough when got to the bus, panting, someone declared that we were like the big fish that the Oizumi elementary school children had described to us yesterday when talking about their group swimming experiences. We definitely have our group mascot! We were met at the first torii gate entrance to the shrine grounds by Margaret Ng’s old college friend, Moriyasu Ito, who is now a priest at the shrine. What a gracious and generous host he was all morning! 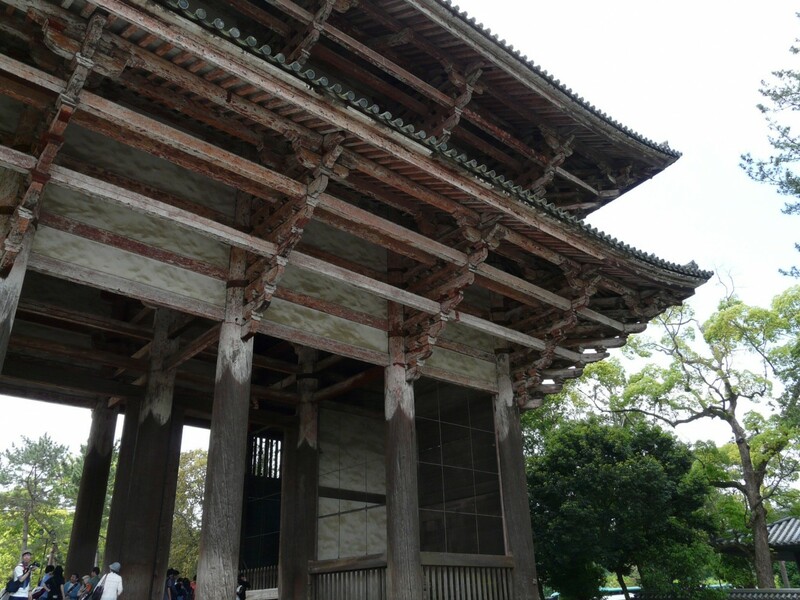 As we walked up the long , broad, gravel walkway to the Shrine, he answered all our questions, and told us about the history of shrine, which was built starting in in 1920 to house the kami , or divine spirit, of the Emperor and Empress Meiji. Seeing such a large, green space right in the middle of one of the largest and busiest cities in the world is quite a reminder of the construction and power of sacred space. 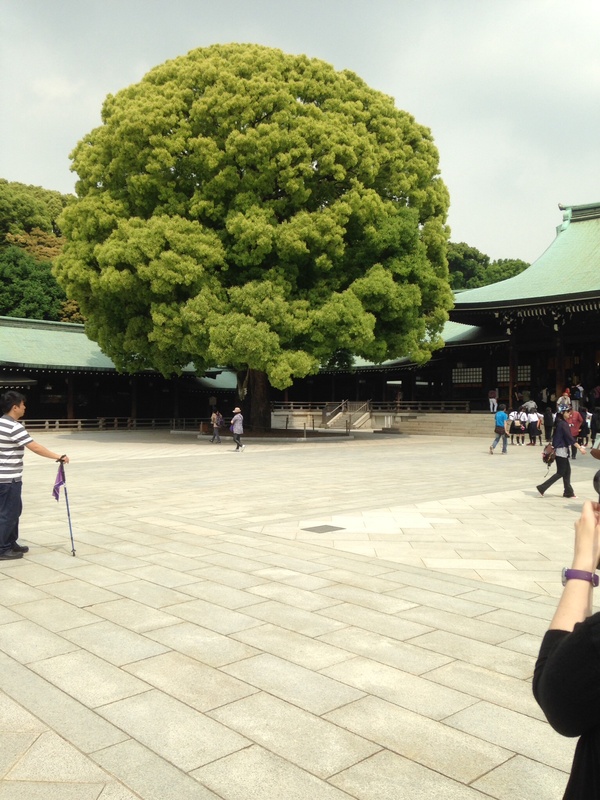 The majestic trees, planned by forestry experts and planted by the people of Japan during the construction of the shrine, really take you away. 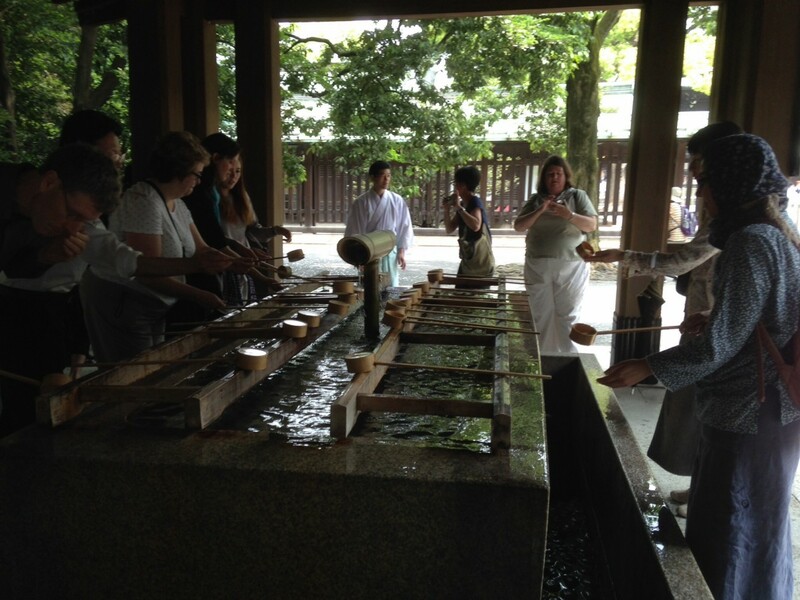 Moriyasu Ito taught us how to purify ourselves before entering the shrine grounds by rinsing our hands and mouths with water, and we proceeded in to observe several ceremonies and to be blessed by the priests ourselves. 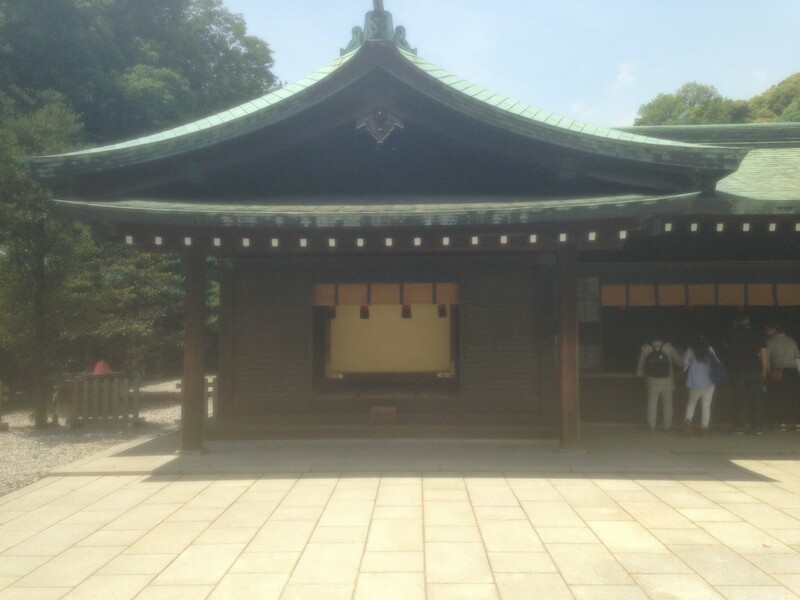 We could not take any pictures of the actual ceremonies we witnessed. Watching the carefully orchestrated, beautiful movements of the priests and shrine maidens was fascinating, a ritual theater for the senses. We also were treated to a presentation on the Shinto religion by Moriyasu Ito, who, with the help of a DVD, told us about Japan’s mythic history, the kami, the role of nature in Shinto, and the religious makeup of Japan. Moriyasu Ito then led us on walk through some more of the grounds before wishing us well. We headed back into the city for more sightseeing and a well deserved, and amazing lunch! 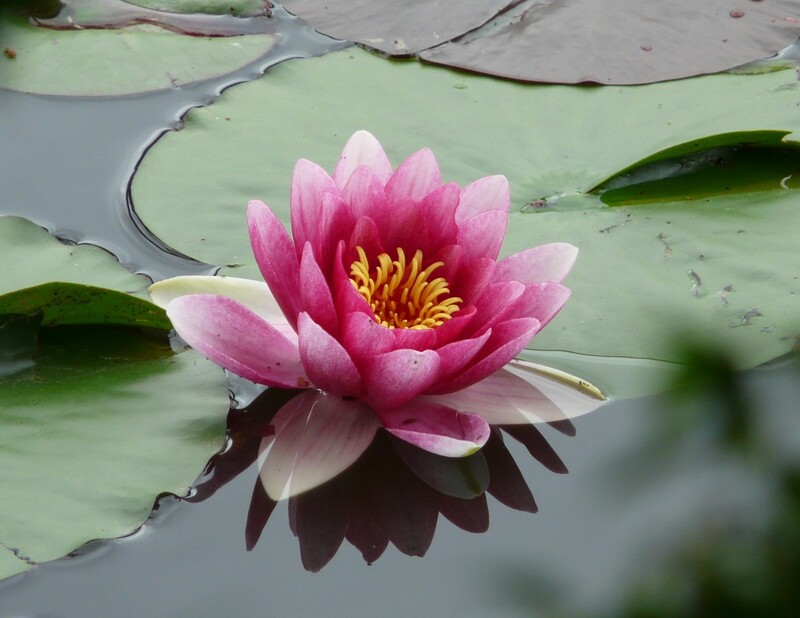 It was unique experience, and one that helps me think more carefully about the ways I as a religious studies scholar have thought about and taught basic ideas such as sacred space, and divisions between the sacred and the secular. 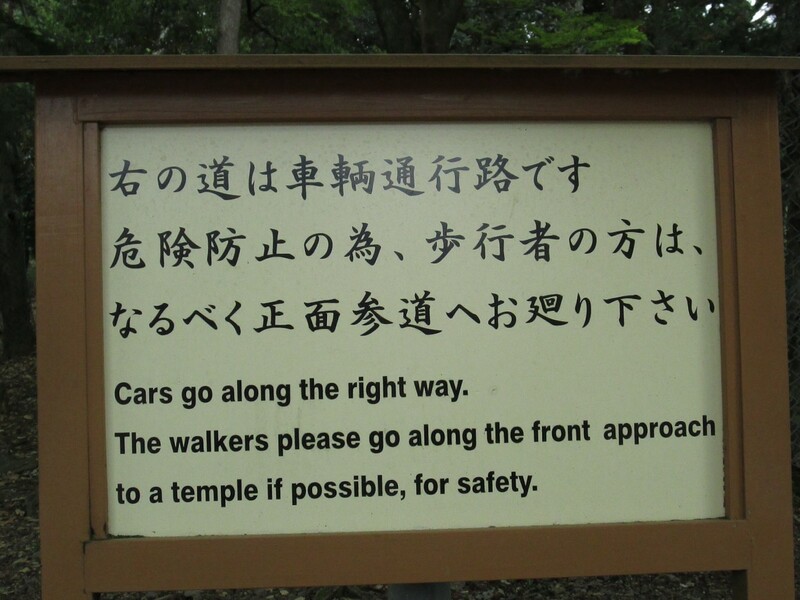 Although Japanese people seem to construct the religious in much different ways than many Americans do, and while many Japanese people will say they have no religion, Meiji Jingu clearly demonstrates the central role of religious ideas and practices in Japanese national life.